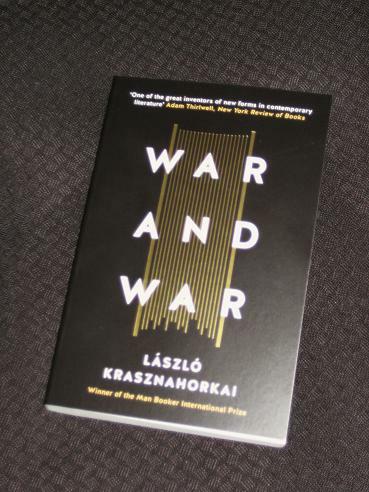 War and War (translated by George Szirtes, review copy courtesy of Tuskar Rock Press and Australian distributor Allen & Unwin) is the story of Korin, a suicidal forty-something archivist from a small Hungarian town, whose life is turned upside down by the discovery of a manuscript in a file he is checking. Equipped only with an old fur coat (and the dollars he’s stitched inside the lining), he manages to make it to Budapest and beyond, eventually ending up in what he has decided is the centre of the world, New York. Thanks to an encounter with an interpreter at the airport, the befuddled Korin (whose English is virtually non-existent) manages to set himself up in an apartment with a laptop, on which he hopes to copy the manuscript out before uploading it to the Internet. If the Man Booker International Prize really is all about rewarding the best work of fiction by a living author published in English for the first time in the UK in a given year (deep breath…), then we might as well just skip next year’s edition and send Krasznahorkai and Szirtes their cheques now. I’ve read every longlisted book for the past five years, and I really can’t say any of them have measured up to War and War (not even Satantango). It’s a ridiculous concept, the story of a crazy man holed up in a small apartment, typing away at his work of copying a manuscript while trying to avoid his rather aggressive landlord, yet at the same time, it’s a work of breathtaking scope, in terms of both language and ideas. Ten years for a British publisher to pick this up? Questions must be asked. Strangely enough, though, this is a trait which actually tends to help him. The murderous youths soon write him off as harmless, and many of the people he is to meet in his travels become intrigued despite themselves, going out of their way to help him. In fact, he can be an endearing figure, with hints of a savant in his behaviour. The reader soon becomes immersed in Korin’s experience, and the writer successfully brings across the emigrant’s feelings on his arrival in New York. After a rather bumpy (and bruising) arrival, Korin eventually finds his feet, walking around the city for hours at a time, unable to do much as a result of the helplessness brought about by the language gap. Not that it stops him talking, even if nobody understands him. However, Korin eventually turns his attention to the task he has set himself, that of preserving the manuscript for digital posterity, and during his breaks from typing, he relates the essence of the text to the interpreter’s lover. What he reveals points to an intriguing, baffling work, one in which four men rescued from a shipwreck in ancient Crete continually flee danger, in search of peace. The same characters appear in each chapter, yet the time and setting change every time. We meet them in front of Cologne Cathedral around 1900, watching the construction; on the road to Mediaeval Venice, hoping to hear news of the city state’s new ruler; as Roman legionaries examining Hadrian’s Wall; and in Gibraltar, eager for news of Columbus’ safe return. Sadly, whenever they think they’ve found a safe haven, they realise that war has caught up with them again (represented by the shadowy stranger Mastemann, another recurring character, the symbol of the ruination of their wishes…). War and War is a wonderful novel, and while it’s recognisably related to Satantango and The Melancholy of Resistance, in many ways it’s more of an achievement. Perhaps the familiar setting of New York helps the Anglophone reader as the novel feels more rooted in reality, even if it uses this base to spring off into the unknown. As always with Krasznahorkai, the writing is the key to it all, his lengthy sentences (one to a section), most extending over several pages, hurrying the reader along, lending the text a frantic air. We feel Korin’s sense of discomfort and unease, even as we’re mesmerised by the waterfall of words the writer immerses us in. A warning for the unwary reader – there are certainly times when it does feel that way for us too. I absolutely adored this book when I read it & think of those I’ve read (Satantango, Seibo there below) this is my favourite, have Melancholy of Resistance on my shelves but that will need to be really exceptional to top war & war. Did you try the internet address in the book? Gary – Yes, but I didn’t want to give it away here! Wow…. Sounds amazing, Tony. I’ve been circling him for a while, and it looks like I may have to plunge in. Erik – I hope you like it as much as I did (fingers crossed!). What a relief you’ve already found the winner. It saves me worrying that Pamuk will publish another eligible novel!! Grant – As I said to Tony Messenger on Twitter, there’s a very big ‘if’ in that statement (as anyone in the Shadow Panel could testify!). I do love that cover (not that it excuses the 10 year delay). I purchased this book earlier this year as my chosen introduction to Kraznahorkai and it’s good to hear all the comments in its favour. It will likely wait until fall when I have less external commitments and more focus after what has been a very trying year so far. Your excellent review increases my enthusiasm. Yes to everything here. It is almost a shame that the film has made Satantango the more famous book. An extraordinary nightmare of a book.